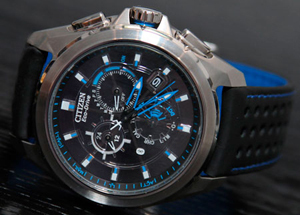 Japanese watchmaker Citizen has released another new product, which at first glance looks very stylish and modern. But few could assume that it is a possibility of Bluetooth connection. The only thing that gives this opportunity – a sign that is present directly on the dial. This is the first model from the company Citizen, equipped with this feature, designed to communicate with phone Apple iPhone. Except label Bluetooth, Proximity news on the dial is also indicators and CALL MAIL, meaning that if your iPhone (4S or above) in your bag or pocket, the watch will let you know about missed calls or new messages, by connecting Bluetooth. “Smart” novelty will remind you of an appointment or an event, if they are assigned to your phone calendar. To indicate that the message has come to the phone, the second hand stops at the display on the inner ring dial long until you get the message. However, stopping the arrows did not affect the time display. Proximity model is presented in a round steel case diameter of 44-45 mm. There is also a version with a black body and black IP coated green hour indexes. Version with a steel body has black and blue marks. The novelty is based on the Japanese quartz movement W760 Eco-Drive with the functions: hours, minutes, seconds, date, day, display am / pm, 60-minute chronograph, Bluetooth. Water Resistant – 100 meters. 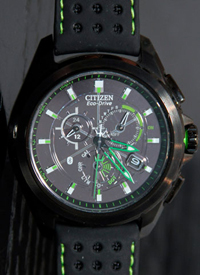 A model of Citizen Proximity is another feature – no need to change the battery. You can buy a watch for $ 550. The model comes on a leather strap in black.